If you want to make your own diaper cake gift for someone, you could get some great ideas from Jill's diaper cake below. She made this lovely diaper cake for a pregnant friend and then submitted a picture and her recipe to share with the rest of us! The flowers on top are so precious and the ribbon is beautiful. Scroll down to see for yourself! 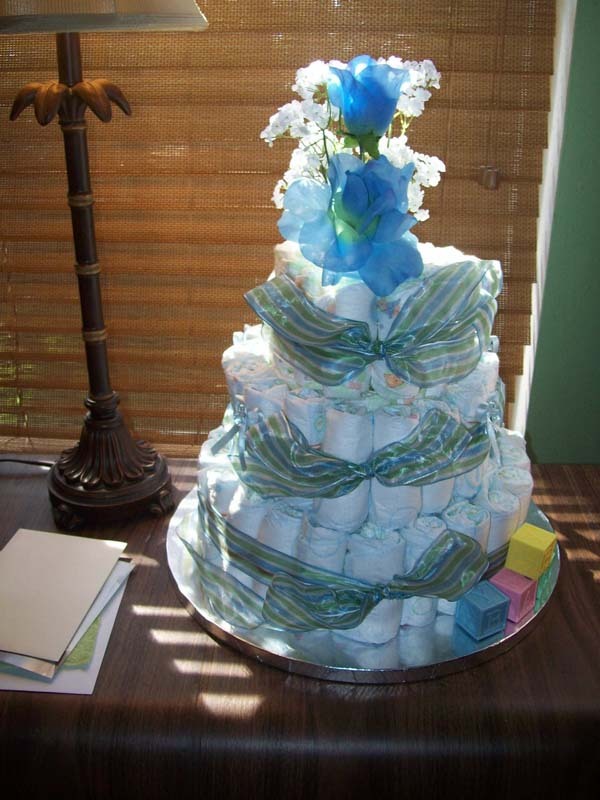 Jill has contributed her diaper cake ideas to our amazing collection of diaper cakes that our amazing, thoughtful readers have submitted. We love to include everyone's ideas to provide inspiration to all who are looking for some cute and clever diaper cake ideas. Jill, Thanks for 'paying it forward' and sharing your darling diaper cake with us!! I used two packages of diapers (one size newborn and one size 1). I rolled and rubber-banded each diaper. A technique I learned in making the towel cakes is that a 12" glass cylinder vase works great for the support and then you can put flowers in it to decorate. I also buy a cake platter from the baking department at the craft store because it helps the finished product look more cake-like. Other than the flowers the decor is mainly the ribbons and some small shower favor gifts that I attached with double-stick tape. It is so easy and makes a great centerpiece. Thanks for the great forum. I don't think I would have had the guts to start the project without seeing the pictures of the examples provided on your website! Thanks Jill! All those brides (who are now expecting) are very lucky to have you as a friend - What a lovely diaper cake gift! Want to see more cute diaper cake gift ideas? Take a look at our entire diaper cake gallery!